At CenturyLink, customers always come first. We build a partnership with every customer, listening to your needs, considering requests as opportunities, and striving to deliver precisely what you want. This illustration represents overview of our commitment to the GSA networx program. Our IP/MPLS architecture delivers a seamless transition from one contract to another. We leverage services that operate with existing networks while providing agencies the means to move effortlessly to more efficient technologies as they emerge. CenturyLink's modern infrastructure powers a Networx solution that directs cost savings to your agency even as networks revitalize. Well-recognized as an industry leader, CenturyLink has a long history of award-winning service delivery. As the first company to integrate the operational capability of an ILEC and an inter-exchange carrier, CenturyLink is uniquely positioned to provide your agency with a single source for local and national communications services. CenturyLink has assembled a team of world-class commercial and federal market leaders as well as smaller, focused-solution providers to offer your agency the widest possible range of potential technology options. Designed with Networx in mind, our CenturyLink Networx Subscriber Web site (Control Center Networx Portal) offers you the versatility to manage ordering, billing, inventory, trouble handling and reporting through one integrated tool. Plus, we provide assistance 24 hours a day, seven days a week. CenturyLink is a transition leader in the market and has already assisted numerous Federal Agencies with major network transitions. Our Networx Engineering and Transition Teams are poised to handle all your transition needs. 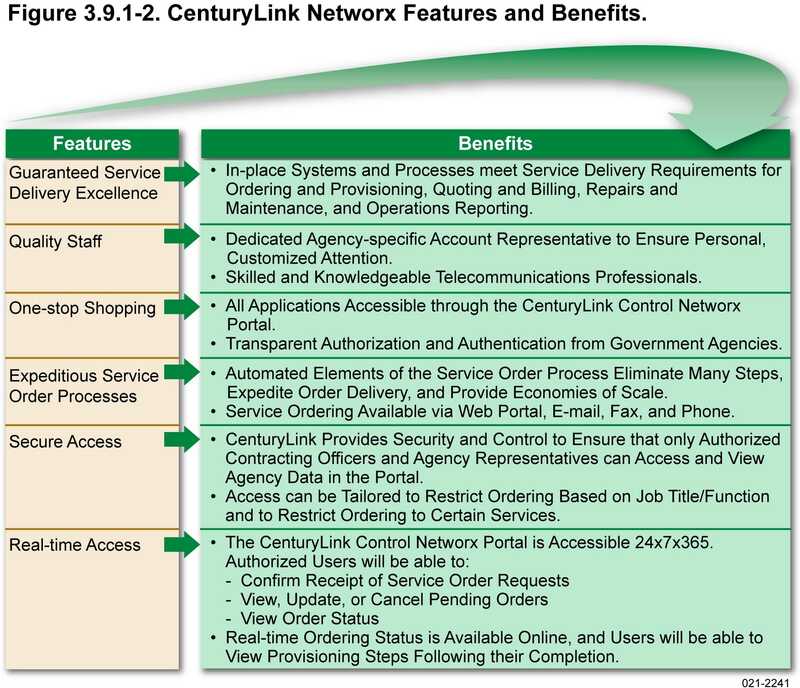 CenturyLink offers specific guarantees and service level agreements that address all aspects of our lifecycle service delivery model. This includes guaranteed service delivery date, smooth implementation, reliable service, technology advancement and world-class support. We strive to deliver successful service implementation throughout the Networx program. Our approach applies proven methodologies supported by talented people, time-tested processes, and the most up-to-date tools available today.